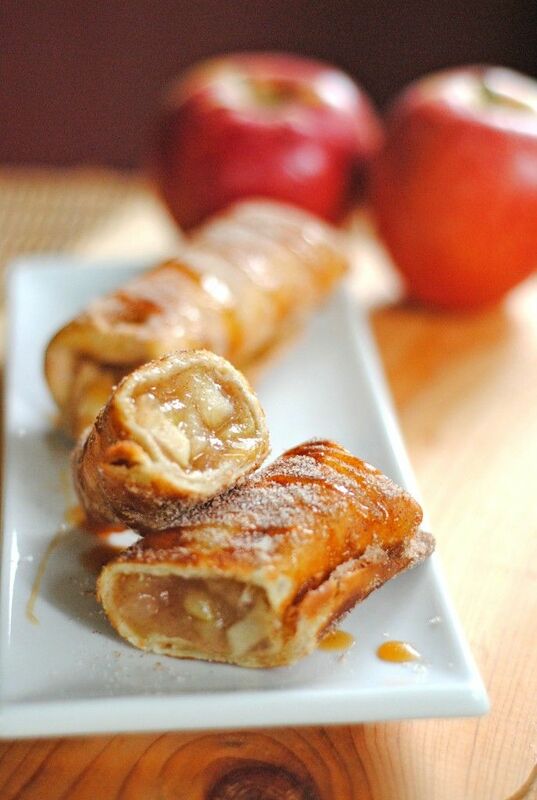 Cinnamon Apple Dessert Chimichangas...OH, MY MY MY! Fruit pie chimichangas? Pure genius! Friends have always teased me, saying that I can slap just about anything on a flour tortilla. I don't even have your traditional sandwich anymore because it goes on a tortilla instead. Something I learned when I was a poor college student. So, I can't believe I didn't think of this myself! Although, I have thrown some cherry sours on one and nuked it -- that's all we had and the store was closed. They were surprisingly good. Haha! Anywho, these are like fried apple pie burritos that are covered in cinnamon, sugar and a drizzle of caramel. OMG! For those who don't know, a chimichanga is a fried burrito. So, basically, this is a fried apple pie burrito. OMG! I'm squealing with delight at the mere thought of it! I still can't believe I've never dreamed this up, myself, especially after slapping all sorts of things on tortillas (various meats, eggs, potatoes, sandwiches, leftovers, etc.) for about 25 years! Where was my brain all that time? Hahaha! My sister and her family came for a visit one weekend and we all love Mexican food. So, I made these for them with apple and blueberry pie fillings. I even combined the two on a few. I made a whole 20-count package of tortillas and they ate them all! * Juanita used a mix of granny smith and gala apples. Combine the water, cornstarch, sugar cinnamon, salt, and lemon juice in a medium saucepan and bring to a boil. Cook for approximately 3 minutes or until the mixture becomes very thick. Add the chopped apples and reduce to a simmer. Allow the apple mixture to simmer until the apples become just tender (approximately 10 minutes). Allow the mixture to cool. Mix cinnamon and sugar in a shallow bowl and set aside. Spoon applie pie filling across the bottom 1/3 of the tortilla. Roll in both sides of the tortilla before rolling up the bottom of the tortilla over the filling, and then continue to roll the tortilla up like a burrito. Meanwhile, heat a small skillet with 1/2 inch of oil. Once oil is hot, fry the chimichangas on all sides until the tortilla turns golden brown (approximately 30 seconds on each side). Remove the chimichangas to a paper towel-lined plate and allow to drain briefly. Immediately roll the warm chimichanga in the cinnamon sugar mixture to coat and serve. You can serve the chimichangas drizzled with caramel sauce if you desire. This crockpot recipe is so wonderful and easy to make! It contains three of my favorite foods and will have your house smelling so good while it cooks that your mouth will be watering the whole time you wait! Carole in Orlando, Florida, posted this recipe on Food.com and says she once had no broth, so mixed a packet of Lipton's Garlic and Herb soup with 4 cups of water and it "really added richness to the broth." Fix a batch of cornbread and you have some good down home comfort food. Oh, and did I mention it was easy to make?!? You betcha! Add all the ingredients to the crockpot, cover, and cook on low for 8 to 10 hours (or on high for about 6 hours). This may also be cooked in a dutch oven on the stove, but you'll need more broth. The crockpot makes broth as it cooks, so doesn't need as much. Use your own judgment on the amount of broth. 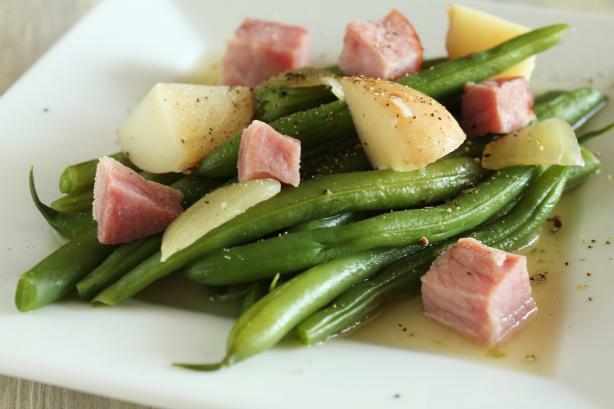 Serve with fresh, sliced tomatoes and corn bread for a great Southern meal. See! Told you that was easy! Now ya just gotta wait for it. That's the hard part! Traditional Hummus: This Middle Eastern Dip is Addicting! This Middle Eastern dip is traditionally made with chickpeas, tahini, lemon juice, and olive oil, but it lends itself to several variations. I've included a few suggested variations at the bottom. Simply prepare and refrigerate it a day ahead, then let it stand at room temperature for 30 minutes before serving. 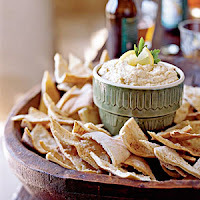 Garnish with a lemon wedge and fresh parsley sprig, and serve with flat bread, pita chips, rye chips, bagel chips, or other choice of dipping chip. Place beans and garlic in a food processor; pulse 5 times or until chopped. Add 1/2 cup water and remaining ingredients; pulse until smooth, scraping down sides as needed. You can either serve it immediately or prepare it ahead of time and refrigerate it. Just be sure to let it sit at room temperature for 30 minutes before serving. Peanut Butter Puddles: A Quick, Easy & Dreamy Choco-Peanut Butter Breakfast Food! Want to impress everyone with minimal effort? Try these Peanut Butter Puddles, which are simply cinnamon rolls with chocolate and peanut butter embellishments. Three ingredients and 20 minutes make these creamy, dreamy choco-peanut butter rolls quick, easy and sweet as can be. Heat oven to 400°F. Spray cookie sheet with cooking spray. Separate dough into 8 rolls; set icing aside. Place rolls 2 inches apart on cookie sheet, cinnamon topping side up. While rolls are baking, place icing in small microwaveable bowl. Microwave uncovered on Medium (50%) 5 to 10 seconds or until thing enough to drizzle. Stir in peanut butter; mixture will stiffen. Shape mixture into eight 1-inch balls. Remove rolls from oven; immediately press and flatten 1 peanut butter ball into center of each roll. Place chocolate chips in the same bowl you used for the icing/peanut butter mixture. Microwave uncovered on Medium (50%) until the chocolate chips are melted enough to drizzle. 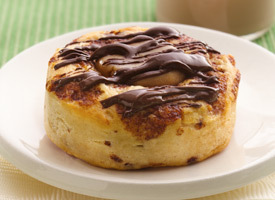 Drizzle rolls with chocolate chips. After drizzling with chocolate, sprinkle tops of rolls with finely chopped roasted peanuts, if desired.